Have you recovered from the emotional rollercoaster of the Olympics? I think I nearly have. If you’ve read this blog before, you’ll know that my dressage experience is nugatory. It’s not something I did as a child and I certainly wasn’t interested in watching it beyond the first phase of the three-day event. Boring! But although our silver-medal eventers done good and the show-jumping team’s victory was a heart-stopper fresh out of Jilly Cooper, I knew that it would be the dressage that gripped me most in 2012. I’m caught up in the stories: I know at least a potted history of the main riders and horses – far more than I can say about showjumping. There’s the Totilas scandal, Rafalca Romney, judging controversies and that rum “special meeting with the judges” for top riders in Beijing. I love the PRE Fuego and fell deeply in love with the Portuguese Alter Real, Rubi, whose rider was trained by the master horseman, Nuno Oliveira. Yes, the British trio of Dujardin, Hester and Bechtolsheimer were on top form and had been for years, but it wasn’t mere patriotism (although if the Olympics don’t make you go a bit jingoistic, what does?) giving me a warm glowy-feeling as I watched the gold medal ceremonies: it was victory in the War of Hyperflexion vs Harmony. If you’ve been reading any dressage forums lately you’ll know that “war” is not really an exaggeration. Rollkur. What is is precisely, according to the FEI? Who does it and do they win medals? Can a horse that has been hyperflexed actually perform good classical dressage according to the FEI’s specifications? What is dressage meant to be about and who controls its soul? I knew next to nothing about the sport when I returned to horses in 2004 but now my eyes are glued to YouTube videos calculating the degree to which Horse X is behind the vertical, or counting the number of footfalls in Horse Y’s canter pirouette, or trying to understand, once and for all, what true collection looks like. I can hum and haw with the best of them on internet forums about Horse Z’s transitions and Rider B’s hands (too strong? like meat hooks? is that horse evading the bit?). I’m familiar with the debate that pitches modern sports dressage against classical noncompetitive haute école. I am, as they say in LA, “emotionally invested” in the points that are dished out by dressage judges. And this is the nub of it. Whether you want to boo or shout hurrah you’re engaged in what’s going on: that’s the hook that keeps you glued to the screen and makes you yell outloud when the final score comes in. After the team competition I pitched a comment piece on the Dressage Wars to a major British paper and began several days’ worth of back-and-forth emails with an editor. The papers and comment pages had been full of people denouncing dressage as “elitist” (it’s an Olympic discipline, what do they expect?) and “posh” (not really), and armchair know-alls weighing in to inform us that dressage was not actually a sport and the horse did all the work anyway. I also pitched a story about the grassroots riding clubs like Stepney Bank and Ebony Horse Club, and the difference they are making to the sport. As the hyperflexion scandal arrived in the warm-up ring at Greenwich, courtesy of Patrick Kittel, it looked like the paper might bite and ask for a comment piece explaining the significance of a win by a team that did not practice horse-throttling, but in the end, it wasn’t to be. To those (mostly Dutch) who think Adelinde Cornelissen’s test on Parzival was better than Charlotte’s I’d say: did Adelinde’s test look light and easy? No. It was mistake-free, but it seemed like Adelinde was using every inch of her pilates-enhanced core plus the rigid curb rein to hold Parzival together. It just wasn’t quite as beautiful as Charlotte’s; Parzival is resistant in the mouth, lacks self-carriage at times and doesn’t truly transfer the weight back to his hindquarters in piaffe. As president of the ground jury Stephen Clarke explained afterwards, it was harmony that won out here. The Netherlands’ Wim Ernes was the only judge to have Adelinde first and Charlotte second. To Whom does the FEI Answer? When we see pictures of dressage horses with extremely flexed necks, are we looking at moments in time? Random split seconds where a horse is tossing its head or biting a fly? In the week of the 2012 London Olympics, photos were released of dressage horses being hyperflexed or ridden in so-called “rollkur”. The defense: Moments in time. The riders didn’t mean to ride this way. The horse spooked. This video was taken at the schooling arena in Greenwich Park on Wednesday the 8th of August 2012. Judge for yourself whether still images purporting to document rollkur are misleading or not. Footage and text from Epona TV. Their words here. UPDATE: the IOC are suing Epona TV over the footage on copyright grounds. Are We Ready for the Freestyle Kur Tomorrow? North vs. South in Dressage? Can you imagine trying to rollkur the neck on that horse? I can’t… This combo scored 71.520 in the first test at Greenwich, below Mr Kittel and Scandic, who got 74.073. What Will Happen at Greenwich Today? 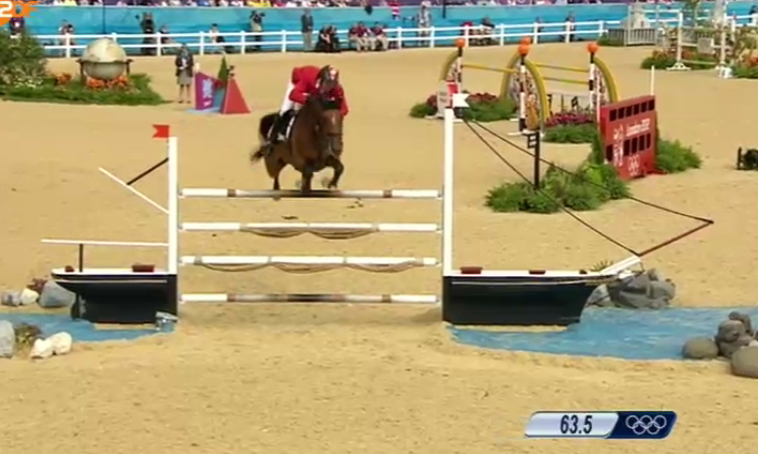 UPDATE: EPONA TV’s OLYMPIC WARM-UP ARENA FOOTAGE. It’s the second day of dressage at the 2012 Olympics, and although the mainstream media has largely ignored the fact that the UK are currently in team gold and individual gold and silver positions thanks to Carl Hester and Laura Bechtolsheimer, they should pay as much attention to the overnight social media storm as they do to allegations of cheating in the Chinese team. What’s rollkur? A controversy that’s been brewing for years in the dressage world. It’s a form of training in which the horse’s head is hauled back “behind the vertical” so that its chin is pressed to its chest. It can damage the horse’s muscle and even bone and it also produces a stiff back that is counterproductive to good dressage. The practice has also been rewarded by dressage judges with plenty of points and prizes. 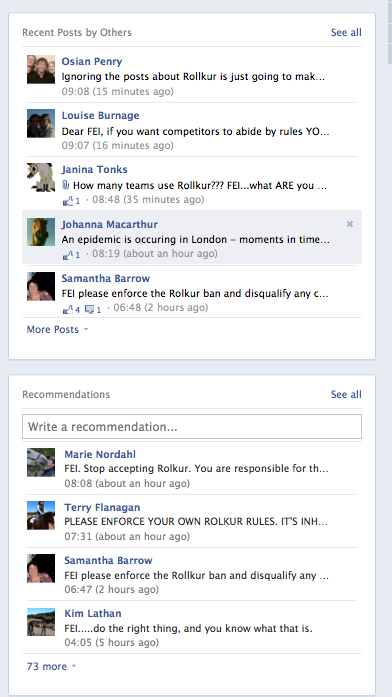 In 2010 the FEI ruled that rollkur was unacceptable, although “low deep and round”, was acceptable. This ruling was given shortly after a Swedish rider, Patrik Kittel, was filmed by Epona TV in the warm-up ring at Odense World Cup Dressage Qualifier, with his horse’s tongue lolling out of its mouth, apparently blue from lack of circulation – something commentators said was due to the fact that he was being forced into neck hyperflexion. Yesterday the FEI, Eurodressage, Olympic and British Dressage Facebook sites were flooded by images of Patrick Kittel warming up a horse with its chin bent to its chest at Greenwich. Here and here. People want to know, what are the FEI and the Olympic authorities going to do about it? There are calls to spectators at the park today to turn their backs or refuse to applaud when certain riders enter the ring. What if there are boos? What if people hold up signs? Whattya gonna do, FEI? UPDATE with further photos here.